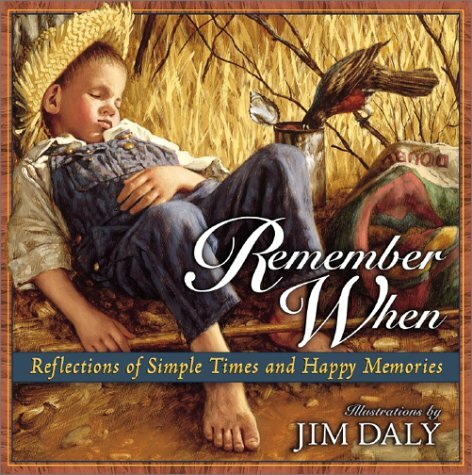 Most known for his popular Loyal Friends and What Little Boys Are Made Of (more than 125,000 combined copies sold), Daly has touched the hearts of people of all ages with his Americana portraits that speak to our yearning for a time when life seemed simpler.In Remember When, quotes, Scriptures, and stories of yesteryear read like a personal memory book. Each painting evokes humanity's goodness, virtue, and faith.Remember when...-- A bedtime story was a cure for anything-- The simplest gifts made life richer-- Family time didn't have to be scheduled-- Playing outdoors with your friends was a preview of heaven-- Everyone knew how grand it was to be an American-- Handmade meant, "made with love"Invite friends, parents, and grandparents to "remember when" with this any-occasion gift book. The images and inspirational prose reflect the good ol' days, and in turn, remind us of the simple pleasures and lasting values that make today as precious.